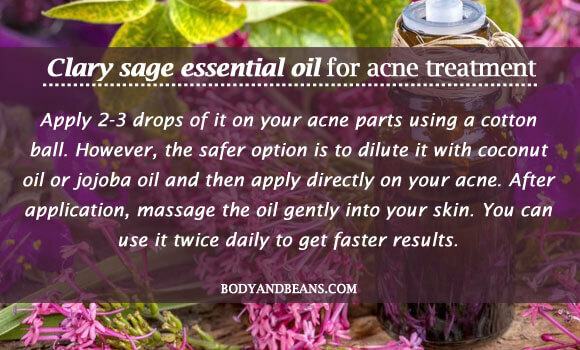 Wondering about the effectiveness of essential oils in treating acne? Well, most essential oils are highly beneficial in treating acne, as they have properties that kill the bacteria and the other germs that cause acne breakouts. In fact, they are far better in treating acne, than the commercial chemical products that promise overnight benefits in dealing with acne and other skin issues. Your skin needs more of natural home remedies than expensive market products and so when we think of acne treatment using natural products, we cannot miss out the importance of essential oils for acne treatment. And, today I am going to discuss about the top 10 essential oils for acne treatment along with the tips on how to apply these oils to get maximum benefits and what precautions one need to take while applying these oils to deal with acne. Ever since I wrote the post on natural home remedies for acne and the other more recent one on teenage acne, I have been receiving a lot of queries and requests where people are asking to write a post exclusively on the usage of essential oils for acne treatment and hence this detailed post. It is natural for common people to worry as most of us have this perception that oils can actually make the skin excessively oily and increase the problem of acne instead of reducing it. Well, that might be partially true for selective oils but, as far as the potentiality of essential oils for acne treatment and other skin diseases are concerned, several recent studies are already a proof that essential oils are magical and offers a number of benefits in treating common skin and hair issues. Acne is most prevalent in the teenage years due to the multiple hormonal changes and other factors that affect an individual at those years. However, now research has also shown that it is not just the teenage girls and boys, but the number of young adults, both male and female getting affected by acne has also severely increased. The primary reason behind such increase in acne cases is related to our modern-day lifestyle. We, today live in an extremely fast paced world which demands us to run at its pace all the time and if any of us cannot match with it, we are simply left behind. In that fear, we get easily stressed out which takes severe toll on our health and beauty and causes acne. Moreover, if you are stressed, it is obvious that you will be suffering from insomnia which will further aggravate your beauty and health problems. And, hence acne has kind of become the most obvious consequence to such hectic lifestyle. Well, it is a little difficult to change the modern-day lifestyle. I am not telling it’s impossible but it will take time to change. But, we simply cannot sit and wait for that time to come. If modern lifestyle has become a rat race, we ourselves must also start balancing our professional and personal lives well. We must take out little time for ourselves and get involved in self-care. While disciplined lifestyle, healthy food habits and exercise can make our health better, essentials oils can put your beauty problems at check especially the problem of acne. So, if you are a believer of using natural products and you love to apply them on your acne, then essential oils may be the best natural ingredient for you. 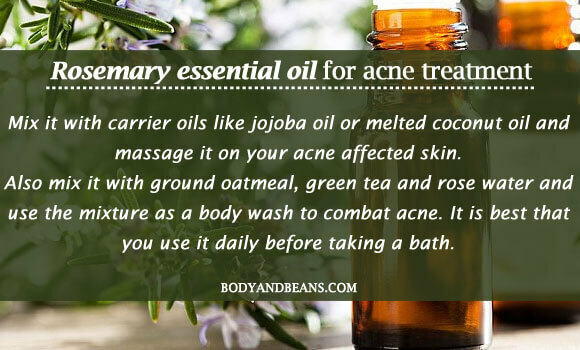 And if you are wondering about which essential oils you should use and how to apply these essential oils for acne treatment, then you are covered. 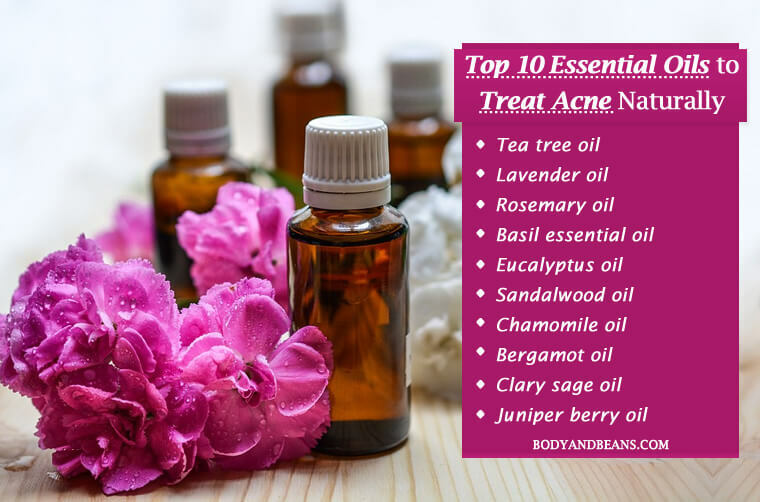 Because today, I am sharing the list of top 10 essential oils for acne treatment and I will also share the complete remedy with application tips. Shall we discuss about the best essential oils for acne treatment? Acne is seriously one of the most common of skin problems and if they are kept untreated or undergo some wrong treatment, they may take a really bad shape. You may have unattractive permanent acne marks on your face and may have to suffer from the painful pimples throughout your life. But, with a little care, you can treat acne easily and naturally with the help of essential oils and enjoy a flawless glowing skin. You just have to choose the right essential oil and follow the application tips carefully. The effectiveness of the essential oil is backed by scientific evidences. So you can give a try with confidence and decide their efficiency of these essential oils in treating acne for yourself within a few weeks. Therefore, if you are interested, check out the below mentioned list of best essential oils for acne treatment and know how to apply these essential oils for maximum benefits in acne and other skin issues. Whenever I talk about the essential oils for acne treatment, the first name that comes to my mind is tea tree oil. 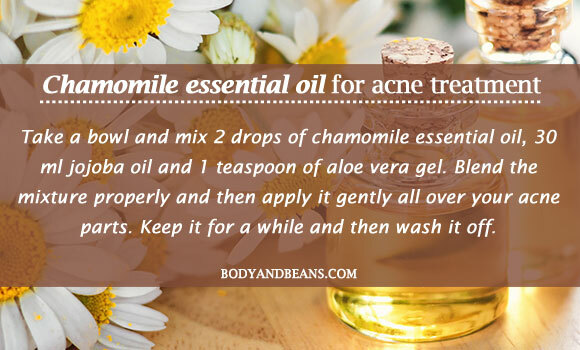 This is probably the best essential oil which can give you excellent results against acne. It is highly antifungal, antiviral and antibacterial in nature and it helps your skin to fight against the acne causing microbes. It is hence used for treating various skin infections and problems with several studies confirming to its effectiveness against acne. Tea tree oil has anti-inflammatory properties as well that reduces the inflammation (that accompaniesacne) and leaves your skin smooth and glowing. 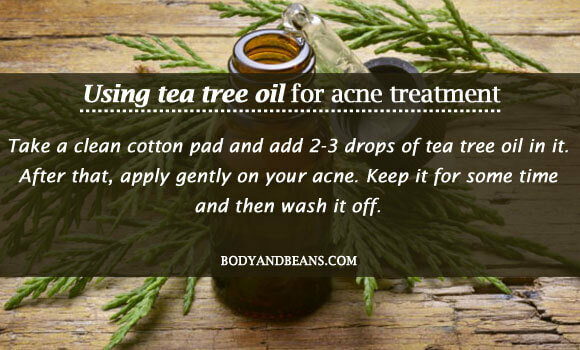 To get the maximum benefits in treating acne with teat tree oil, take a clean cotton pad and add 2-3 drops of tea tree oil in it. After that, apply gently on your acne. Keep it for some time and then wash it off. You may also mix the oil with your daily face wash and use that on a daily basis. However, tea tree oil may irritate your skin, especially if your skin is too sensitive, so it is better that you do a patch test before you apply all over the acne prone skin. Also avoid over usage of it as it may leave your skin excessively dry and thus increase the oil production causing more breakouts. If you have got too much of a sensitive skin, then lavender essential oil may be the best choice for you. Lavender oil is highly antimicrobial in nature and contains antioxidants that are highly beneficial for your irritated skin. It nourishes your skin and gives a smooth texture to it. It also works against the scars and the dark spots caused by acne and make your skin blemish free. In fact, studies have shown that it calms and relaxes your body once you inhale the fragrance. It has got a positive influence on your mood swings, brain activities and your central nervous system. It also improves your quality of sleep and reduces stress, which are the two major factors behind the occurrence of acne in young adults. 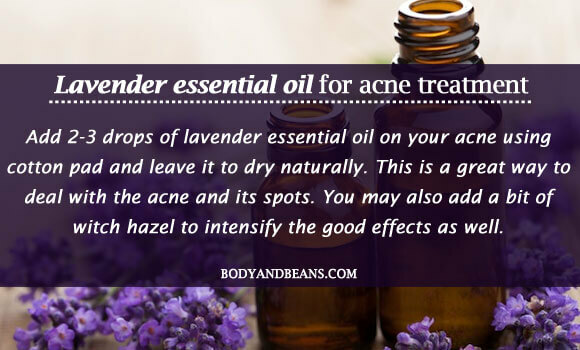 You can simply add 2-3 drops of lavender essential oil on your acne using cotton pad and leave it to dry naturally. This is a great way to deal with the acne and its spots. You may also add a bit of witch hazel to intensify the good effects as well. Repeat these methods of applying lavender essential oil for acne treatment for at least 3 consecutive days to get fast results and maximum benefits. Another effective method of using lavender essential oil is by mixing it with boiling water. You need to keep it in a bowl and then bent over the bowl and inhale the steam. Make sure that you cover your head and also cover the bowl using a towel during it. Avoid wiping your face and instead let it dry naturally. After sometimes, apply ice cubes wrapped in clean cloth on your face. Another essential oil that is highly beneficial for acne is rosemary essential oil. It is highly beneficial for acne as it helps your skin eliminate excess oil and sebum from the skin and prevent acne formation. It is also highly effective against bacteria and the study published in the “Journal of Medical Food” shows its potentiality to reduce bacteria-induced swellings and inflammations on skin lesions. Rosemary also reduces the redness and the marks caused by acne and leave your skin clean and glowing. There are many interesting ways of using rosemary essential oil. Firstly, you may fix it with carrier oils like jojoba oil or melted coconut oil and massage it on your acne affected akin. Secondly, you may also mix it with ground oatmeal, green tea and rose water and use the mixture as a body wash to combat acne. It is best that you use it daily before taking a bath. However, avoid using rosemary oil in case you are pregnant or is a victim of epilepsy. Basil oil is great for your skin and you can definitely use it as one of the essential oils for acne treatment. It is highly antimicrobial in nature that fights the germs and soothes your skin against acne and other skin irritations. In one study published in “International Journal of Cosmetic Science“, it is shown that holy basil extracts and sweet basil was very much effective against acnes bacteria which ultimately led to the conclusion that tropical application of basil oil was good to treat acne. Basil oil has linoleic acid in it that also soothes the swellings and inflammations that is accompanied by acne. There are a number of health benefits of Holy basil and if you are looking for an effective remedy to treat acne, you should try using basil oil and experience its benefits. Take basil oil and aloe vera gel in equal amounts and give it a good mix. Then apply the mixture on your acne areas gently using your finger. Leave it for 10-15 minutes and wash using normal water. Use this remedy two times on a daily basis for best results. You can also use the eucalyptus essential oil for acne treatment as it has the ability to reduce the production of sebum whose accumulation is mostly responsible for the occurrence of acne. It is also anti-bacterial in nature and it helps fights the germs and does not let the pimples to aggravate. It keeps your skin clean and gets rid of all the dead skin cells and the other impurities and thus lessens the acne problem to a great extent. In fact, it is highly effective in treating most kinds of skin irritations and takes care of boils & cysts as well. In order to use eucalyptus essential oil, take a mild moisturizer and then mix 2-3 drops of eucalyptus essential oil in it. After that, apply the solution to the affected acne parts and let it stay to dry naturally. Do this every night before you go to sleep. However, eucalyptus essential oil may cause respiratory trouble in case you have asthma and so you may avoid this remedy and use some other one. One of the best essential oils for acne treatment definitely includes sandalwood essential oil as it is quite skin friendly and suits maximum skin types. Sandalwood oil is one perfect antiseptic having astringent properties which helps you in locking the moisture. This reduces the severity of the acne and makes your skin glow. It also helps your skin get rid of the bacteria that blocks your skin pores. Several studies have also proven the efficiency of Indian sandalwood oil in treating not just acne but several other skin problems like psoriasis as well. 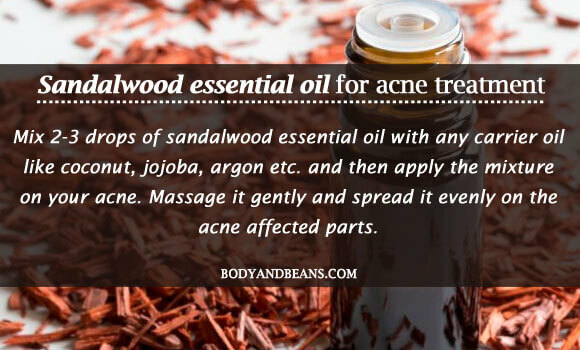 So, you must try out sandalwood essential oil for acne treatment. It is best to mix 2-3 drops of sandalwood essential oil with any carrier oil like coconut, jojoba, argan etc. and then apply the mixture on your acne. Massage it gently and spread it evenly on the acne affected parts. Use this remedy two times on a daily basis for effective results. However, although it is a safe option but it is best to avoid it when pregnant or nursing. Also, avoid its contact with your eyes. If you want to get rid of your acne as well as enjoy calming effects, then chamomile essential oil is definitely one of the best essential oil that you may like to try. Research has shown it to be the perfect herbal medicine that is highly beneficial against skin inflammation and has the ability to soothe the skin very fast. It also contains anti-bacterial properties that not just lessens the acne occurrence but also reduces the common visible signs of skin inflammation and swelling like zits, bumps and redness etc. as well. Take a bowl and mix 2 drops of chamomile essential oil, 30 ml jojoba oil and 1 teaspoon of aloe vera gel. Blend the mixture properly and then apply it gently all over your acne parts. Keep it for a while and then wash it off. Doing this every day twice will reward you with fast benefits. It will make skin smooth, glowing and highly moisturized. However, I do not recommend you to use this during pregnancy or nursing but if you want to still use it, then consult a healthcare professional first and then use it. 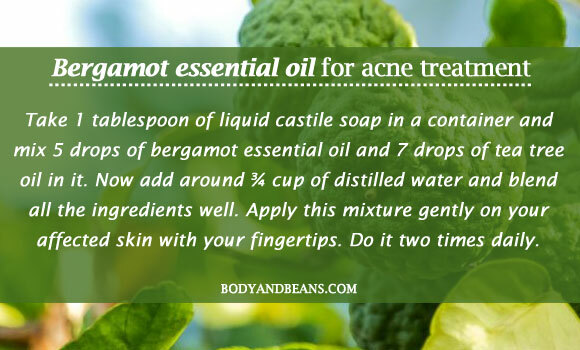 Bergamot essential oil is great for acne infected skin. It is antibacterial in nature and that helps it fight the germs and lessen the acne. It also treats the skin inflammations and makes it plain and smooth. It also unclogs the pores and keeps the impurities away from your skin. Moreover, bergamot also removes the excess oil and disinfects your skin. To get the maximum benefits of bergamot essential oil in treating acne, at first take 1 tablespoon of liquid castile soap in a container and mix 5 drops of bergamot essential oil and 7 drops of tea tree oil in it. Now add around ¾ cup of distilled water and blend all the ingredients well. Apply this mixture gently on your affected skin with your fingertips. Do it two times daily. However, make sure you do not use it more than two times as it may harm skin. Also, avoid going out in the sun immediately after applying this mixture. You may like to apply this remedy just before the bedtime. You can also use clary sage essential oil to reduce acne as it is one of the best essential oils for acne treatment. The vital reason behind it is the presence of linalyl acetate in it that is instrumental in soothing inflammation and reducing acne and other skin irritations. It also regulates oil production and prevents the occurrence of acne breakouts. Moreover, studies has confirmed that clary sage oil also inhibits the growth of bacteria and further prevent acne and other skin irritations. Clary sage also acts in reducing stress, the major factor behind acne in young adults. In fact, even studies like the one published in journal of “Phytotherapy Research” has shown that clary sage oil inhalation can actually reduce the levels of stress hormone cortisol by 36 percent. Hence it is the perfect antidepressant that fights anxiety and uplifts your mood. In fact, with proper usage of clary sage oil, one can get rid of insomnia as well. If you are tired of acne and pimples and want to use clary sage oil then simply apply 2-3 drops of it on your acne parts using a cotton ball. However, the safer option is to dilute it with coconut oil or jojoba oil and then apply directly on your acne. After application, massage the oil gently into your skin. You can use it twice daily to get faster results. Juniper berry essential oil is great for acne prone skin and it is indeed one of the most popular essential oils for acne treatment. The main reason of its popularity is its anti-bacterial nature that helps your skin fight the germs and reduce the occurrence of acne. Studies have also confirmed it being highly beneficial against acne like the 2005 study published in “Pharmaceutical Development and Technology”. Components like alpha-pinene, beta-pinene and p-cymene present in juniper berry essential oil is very good for acne and hence you can apply it on your skin topically. It gives you a warming sensation and reduces all of the skin blemishes. 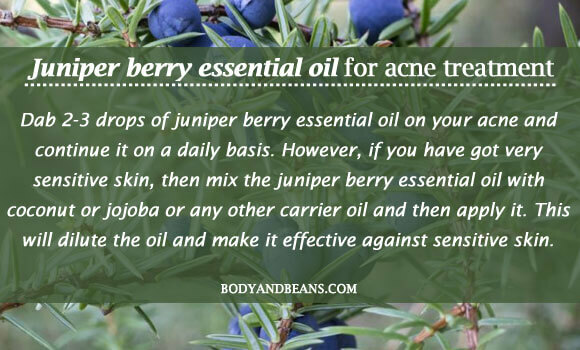 Dab 2-3 drops of juniper berry essential oil on your acne and continue it on a daily basis. However, if you have got very sensitive skin, then mix the juniper berry essential oil with coconut or jojoba or any other carrier oil and then apply it. This will dilute the oil and make it effective against sensitive skin. Another method of using it is by applying it by mixing it with aloe vera gel and then leaving it overnight. Use it once on a daily basis to get rid of acne quickly and easily. The above-mentioned oils are very good for acne prone skin but as you know, we all have different skin types and some of us may be allergic to certain oils. 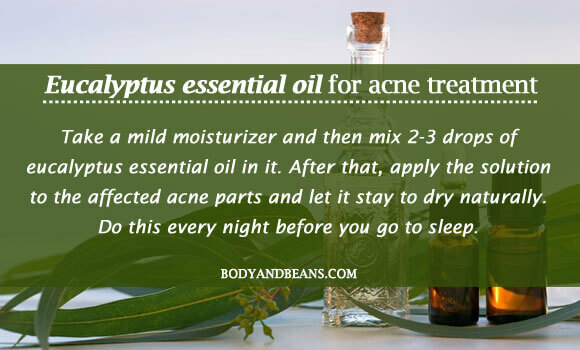 We have already discussed about how to use these essential oils for acne treatment, but it is important to know about the precautions required while apply these essential oils. Listed below are some the precautions that you should take while using essential oils. Every one of us have different skin types and so to make sure that you are not allergenic to any of these oils, please do a patch test before applying it directly on the face. It is advisable for the children and pregnant ladies to consult a doctor before using any of these oils. It is best that you avoid going out in the sun immediately after applying the oils as some oils like the bergamot oil is phototoxic so it may irritate your skin. Do some basic research on the potency of the essential oil that you chose for acne treatment. If none of the oils work for you, then never hesitate to consult a good dermatologist and take proper medical help. Acnes are very irritating but with proper care, you can get rid of them easily. There are several medicines or commercial products for acne but if you want to treat your acne naturally, then the essential oils are certainly the best thing to try. 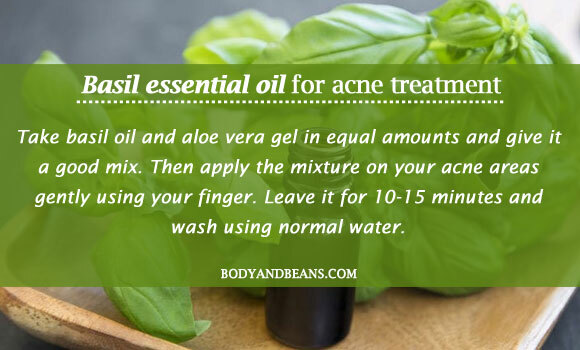 I have already discussed about the top 10 essential oils for acne treatment with tips on how to apply various essential oils to treat acne naturally. When followed properly, you are can get rid of acne easily and end up with flawless glowing skin. Apart from using the various essential oils for acne treatment, it is best that you try to lead a healthy lifestyle. 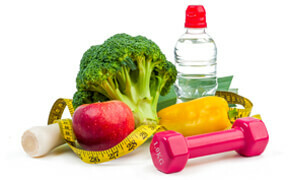 Eat healthy nutritious foods and avoid the junk foods of all types. The unhealthy habits of smoking and excessive alcohol consumption must also be avoided to get gorgeous skin. Also, maintain fixed meal timings and sleep timings to keep yourselves healthy and beautiful and control your stress with proper sleep, relaxation and mediation. In short, bring discipline in your life and leave the rest on the essential oils to get healthy and beautiful skin with no place for acne. Do you have acne? Have you tried any of these essential oils to treat acne naturally? Which essential oil remedy worked for you in treating acne? Share with us by commenting below. And if you are yet to try any of these essential oils for acne treatment, then give it a try and let us know which one worked best for you. I sincerely hope you get gorgeous acne free skin using these essential oils. Informative article! I love to use essential oils for skin care. These oils are brilliant for many skin problems and infections including acne. Thanks for the great info.